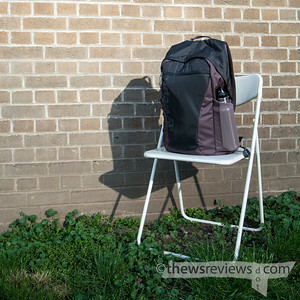 Yeah, but: Yes, it's yet another camera bag review. 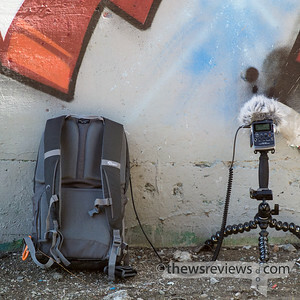 The Long Version: I'm going to get this out of the way right up front – the Lowepro Photo Hatchback AW is an exceptional mixed-use camera daypack. I've owned seven different backpacks, with four currently in the rotation, and the 22L Hatchback is easily my favourite. As a mixed-use bag the Hatchback has a large compartment to hold non-camera items, which is reached through a zippered opening across top of the bag. The secret to the bag, and the feature that gives it its name, is the body-side access panel to the camera compartment that takes up its lower half. This is basically invisible when the bag's being worn, letting the Photo Hatchback be mistaken for a basic daypack or student's book bag. The Hatchback looks so unremarkable that it's almost remarkable. There's a fabric grab-handle on top, tall elastic water-bottle pockets on each side, and a couple of access zippers across the top and front of the bag. There's no tangle of cinch straps and clips, no lash points for MOLLE gear, no intricate panels of heavy-weight Cordura that can double as a cheese grater. It's an untechnical and unpretentious bag. The lower compartment of the 22L Hatchback can carry a large SLR with a short lens attached. There's still room alongside for another lens and perhaps another small accessory. The 60/2.8G with its hood attached squeaks in and still leaves room for my entire three-lens Nikon V1 kit alongside it, and I can tuck the battery charger in as well. Even my F5 can fit by lying flat when it's lensless or with a 50/1.4D on it; there's still room for a decent-sized lens beside it, too. This could be an uber-stealth way to carry a full-sized SLR and separate standard zoom. The top compartment can fit enough stuff to get me through an overnight trip somewhere. It has two internal mesh organizer pockets and a zippered nylon pocket that's big enough to hold tickets, passports, or paperback books separately and securely. There's even a keychain leash inside. The side bottle pockets are tall enough to securely hold an 800ml steel water bottle or 710ml plastic soft drink bottle, and strong enough that I'll never worry about losing what I carry. Considering that Penny's MEC Book Bag will dump her travel mug onto the sidewalk with regularity, this ability isn't something to take for granted. An iPad-like tablet, or the svelte 11" Macbook Air, will fit in the padded slot in the Hatchback's front organizer panel. I really prefer this to the customary back-panel laptop slot because it stops the weight of the bag's contents from squeezing and damaging the laptop screen. There's also an unpadded front compartment to the organizer panel, and it has a triangular profile that makes it substantially wider at the bottom, making it very useful for longer objects that otherwise wouldn't fit inside the bag. My day-job load is to have a camera or two, like my GA645zi, V1 system, or Ricoh GRD4 tucked into the camera compartment. My laptop, audio recorder, and its shock-mount go in the front panel, where they can be reached easily. A water bottle fits in one side pocket, and an umbrella or beverage – depending on the weather forecast – rides in the other. The top compartment can hold a light jacket when it's cold or a change of clothes when its hot, and a brown-bag lunch will fit in either the top or bottom of the bag depending on my priorities for the day. For more serious outings this little bag will hold my D800 with 60/2.8G (or 50/1.4 if I expect it to be dark out) and Nikon V1 system, with its two zooms and fast normal lens, in the camera compartment. There's still room in there for their mutual charger or a compact camera. My audio recorder's shock mount assembly and Joby Gorillapod Focus, with its Manfrotto 484RC2 head, fit side-by-side down the front panel. Then I can either put the audio recorder and headphones into the top compartment loose – which is great for recording when I may need to move along promptly, like under a highway overpass – or use a Crumpler Haven insert to keep them organized, along with another small camera, alternative windscreen, multitool, and other bits and pieces that make up my audio kit. 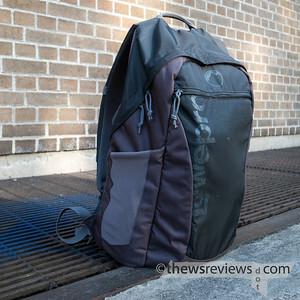 Like the Flipside Sport bag that I previously reviewed, the padded camera compartment is removable, and has a built-in draw-stringed cover and handles for the occasion. (Protip: this is a great place to stash a few runs of gaffer tape.) The interior panel that divides the bag is held in place with velcro, so it can be tucked out of the way to create a single full-height compartment should the need ever arise. As one of Lowepro's "AW" bags the Hatchback includes a cover for poor weather. I'm normally not too diligent about deploying these, but because this is a lighter-weight bag I do use it when I'm carrying my laptop. I really like the outward-facing, top-loading tablet-slash-Macbook-Air compartment, but it closes with a standard YKK zipper and has only a modest storm flap to cover it. Life's a barter. The good news is that the AW cover is well-designed, and has loops that secure it around the shoulder straps at the top of the bag. 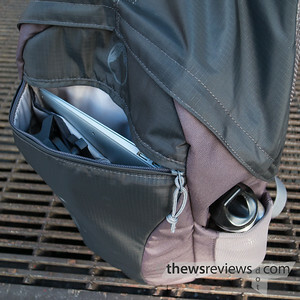 The cut is roomy enough to fit over water bottles or similarly-sized items in the side pockets, as well. 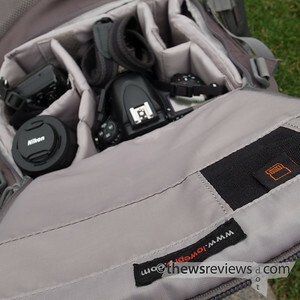 It's also handy for keeping the front of the bag clean when it's set down, as the camera compartment remains accessible. And of course when the cover's not needed it tucks into its spacious compartment at the bottom of the bag, where it provides a little extra cushion to the contents. The fit on the 22L model is wider than I'm used to, with the straps resting toward the outside of my not-overly-broad shoulders. The sternum strap, which is removable, becomes very useful if I'm carrying a lot of weight. Otherwise I just see it as an opportunity to improve my posture, and it's a fairly easy trait to live with. There is also a removable webbing waist strap, which I immediately removed and haven't missed. While this bag can carry a lot of weight when it needs to, other bags, like as my Flipside Sport 20L, will still be filling the heavy overland hauler role for me. 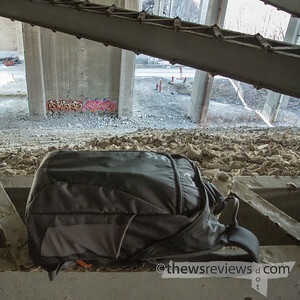 Even with the large and stylishly-distressed 'LOWEPRO' running up the front of it, this bag looks like nothing. In my neighbourhood, which is on the edge of a large university, wearing this bag is the next best thing to being invisible. It's also worth pointing out that that the Hatchback is the least expensive of all of the camera backpacks I've ever owned, which makes this next bit especially telling: it and my Billingham Hadley Pro are the only camera-centric bags that I'll use even when I'm not carrying a camera. I don't drive, so having the right bag matters a lot – I walk, at least part of the way, for everything I do. If I'm moving it means that I'm carrying everything that I need. I've spent hours sitting with the Hatchback on my lap during inter-city bus trips, have walked a couple hundred kilometres with it in the city centre, and I may have even taken it around fences and into places that I might need to depart from unexpectedly. After all that I've had no problems and no complaints. It doesn't look like much, but the Hatchback is a pretty awesome little bag. Probably… somewhat. Removing the camera compartment and opening up the middle divider, to create a single-compartment daypack, looks like it will allow a 15"MBP to fit flat inside. (Going by the computer's published dimensions and a tape measure.) But there's nothing to hold the computer in place, padding, or any other modern concession to carrying electronics. At the end I bought it (the 22 liters one) and indeed a MBP 15" fits perfect :-). Best!